The Trump administration promised the electorate that it would fix trade imbalances that cost American jobs, and so amped up its rhetoric ahead of President Donald Trump’s meeting with Chinese leader Xi Jinping on April 6 and 7. “Thousands of factories have been stolen from our country. … Under my administration, the theft of American prosperity will end,” Trump said on March 31. The administration has toyed with the idea of imposing tariffs or implementing a so-called border adjustment tax, penalizing imports and providing tax breaks for exports. 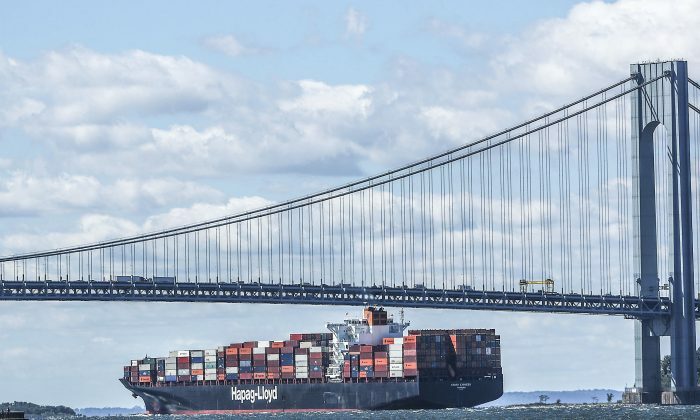 These measures would reduce the trade deficit, the net tally between a nation’s exports and imports, but they would also distort supply chains and probably lead to retaliation from trading partners. But what if, despite the documented Chinese cheating in trade, it is not trade that is the problem? In that case, there would have to be another reason for the $502 billion U.S. trade deficit in 2016—one that’s hiding in plain sight and that could open up new options for fixing the imbalances. New research suggests free trade in investment capital leads to imbalances in the trade account. The traditional view is that a trade deficit in goods needs to be financed by exporting assets like Treasury bonds and real estate so that the two accounts balance out. Capital pays for the goods, and the country’s external balance nets out to zero. The market’s original role as a mechanism for preventing trade imbalances from getting out of hand via currency adjustments has been lost. However, Richard Koo, chief economist at the Nomura Research Institute, thinks the trade in capital is now more important than trade in goods. “Some 95 percent of all currency trading now consists of capital transactions, with trade-related transactions accounting for just 5 percent of total activity. The market’s original role as a mechanism for preventing trade imbalances from getting out of hand via currency adjustments has been lost as a result,” he wrote in a February report. If the only international financial transactions between two countries were to settle trade, the exchange rate between two trading nations would eventually compensate for differences in competitiveness. For example, if China has a competitive advantage from lower wages or unfair trade subsidies and it achieves a trade surplus with the United States, U.S. importers would have to sell dollars to obtain Chinese goods. The selling pressure would lead to a lower dollar, thus making Chinese goods more expensive and American products more competitive. “Free trade by itself would not have produced the consequences we see today. 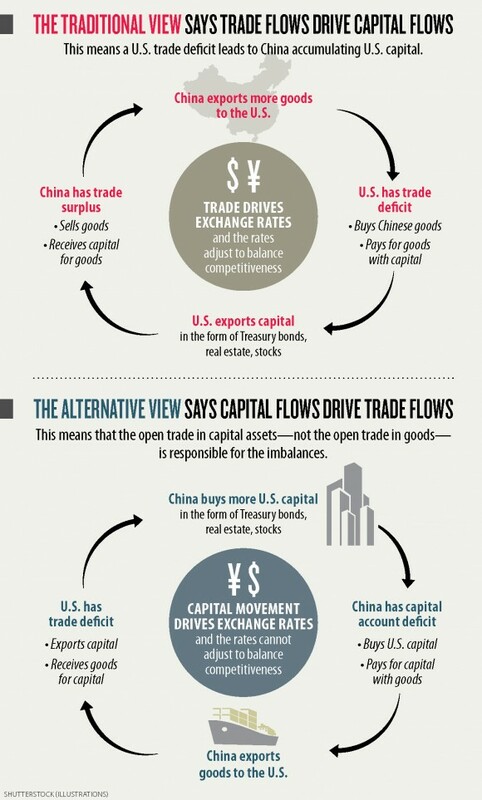 … But adding free capital flows to the mix destroys [the] mechanism,” wrote Koo. U.S. capital markets are even more open to foreigners than U.S. goods markets. Foreigners can buy any asset in any quantity, except for when national security is at stake. As a result, foreigners own roughly $30 trillion of U.S. assets, like stocks, Treasury bonds, and real estate, as of the third quarter of 2016. Their demand for U.S. assets keeps the dollar high, making American goods less competitive, which is one reason for the trade deficit. So why do foreigners buy so many U.S. assets? Peking University professor Michael Pettis says it’s because of high domestic savings rates in surplus countries, which cannot be satisfied by domestic investment alone. “Countries with persistent trade surpluses have savings rates that exceed domestic investment, mainly because ordinary households in that country, which are responsible for most of a country’s consumption, retain too small a share of their country’s GDP relative to government, businesses, or the wealthy,” Pettis wrote in a report. This is as true for China as it is for Germany and Japan. In other words, because of failed foreign economic policies, the households in the trade surplus countries don’t make enough to contribute enough to domestic spending. The government and businesses save and invest their share of domestic income. However, because of these imbalances, there aren’t enough viable investment opportunities, and the money goes looking for returns abroad. “The countries that are most likely to absorb imbalances elsewhere … are not those with the most open markets for traded goods, but rather those with the most open capital markets,” wrote Pettis. Like the United States. Once the United States has a surplus in its capital account, because of the influx of excess savings from abroad, it needs to spend the money through the trade account for the international accounts to balance, leading to a trade deficit in goods and services. The demand for capital bids up the dollar, but this makes investing in the United States even more attractive because of the potential capital gain in the foreign exchange market. This worsens the trade deficit problem because it makes U.S. goods less competitive in global markets. Although the Trump administration hasn’t talked about open capital markets as the reason for the trade deficit, it understands that the exchange rate is a key variable. Trump has called China the “grand champions” of currency manipulation. If China and the other surplus countries cannot correct their structural domestic imbalances and stop exporting their savings to the United States, then a lower U.S. dollar would be a solution to help close the competitiveness gap, according to Koo. It would have fewer side effects than slapping tariffs on foreign goods or using a border adjustment tax.